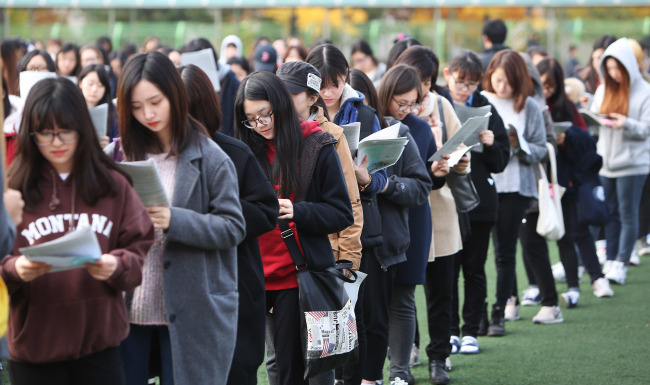 As South Korean students across the country honed their academic skills in the final preparation for this year’s “Suneung” college entrance exam Wednesday, the authorities also prepared to support the youngsters for what many still consider to be a “life-deciding” test. The exam has been held in Korea on the second Thursday of November annually since 1993. Although the college admission also includes interviews and essays, getting a top grade on the nine-level curved grading system is essential for entering top-tier higher education institutes here. A total of 631,187 students will take the Suneung at 1,212 test venues set up in their adjacent schools. The test-takers visited their respective test venues on Wednesday on the recommendation of the Education Ministry. Each year, authorities implement extensive measures to aid test-takers. The National Police Agency said it would implement special traffic controls from 6 a.m. to 6 p.m., an hour after the exam is over. Some 8,000 police officers will be dispatched on roads near schools to aid any test-takers making the last-minute rush. Cars and public transportation headed to test venues ― which will be marked ― will have priority on the roads. Opening hours for government offices have been changed from 9 a.m. to 10 a.m. to alleviate the morning rush hour, and the government advised corporations to follow suit. Airplanes will be forbidden from taking off or landing, and buses and trains will be asked to operate silently from 1:10 p.m. to 1:35 p.m., when listening comprehension for the English section will take place. Superstitions of all sorts are also rampant among students facing the immense pressure of Suneung. Dropping something is a common taboo, as “drop” in Korean is also used to describe failing a test. Traditional foods like “yeot” ― a taffy-like snack ― and rice cakes are popular gifts for test takers due to their sticky texture, as “stick” in Korean is the same word as to “pass” a test. Local education firms like Uway say the biggest hurdle for the students is not the questions themselves but trying to avoid mistakes. Last year’s Suneung was widely criticized for being “too easy,” and Uway pointed out that the trend of an “easy” Suneung was likely to continue this year, given the relative ease of the state-commissioned mock exams. Gender disparity is also another recent trend. According to Korea Institute for Curriculum and Evaluation, girls got higher scores than boys in all the major subjects ― Korean language, English and even math, which was traditionally dominated by male students. The KICE’s top concern is not to repeat last year’s fiasco over faulty questions. The state-run organization, which is in charge of making the Suneung questions, was forced to admit its faults and accept multiple answers for two questions in the biology and English language sections. It was the second time in two years the KICE was blamed for faulty questions, forcing the Education Ministry to launch a committee on reforming the exams and Kim Sung-hoon, the head of the KICE, to resign.